Meal Planning & Prep made easy! Back in my catering days, I had perfected my planning, prepping, and organizing skills when it came to events. I had to have a detailed and precise menus, shopping lists across several events, recipes, as well as daily preparation lists. So compared to a 200 person wedding, my 4-person family is – dare I say – easy. However, I know that you may not have been a caterer in your former lives! Therefore, some of this planning and prep does not come naturally, so I am here to share my experience and tips to hopefully help! 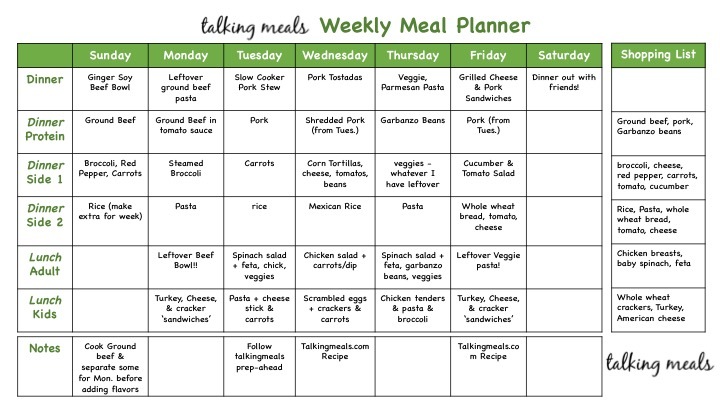 In my Weekly Meal Plans, I have made this soooooo easy for you! I have already consolidated 3 recipes into 1 shopping list and prep-ahead instructions. Check out all of the Meal Kit Menus here! First download and print this helpful template! Select 3 different dinner recipes that can each have some leftovers for lunches or even an extra dinner for 1-2 ppl. Any more than Dinner 3 recipes can be overwhelming. Anything in a slow cooker is a great option, but make ahead casseroles or soups are terrific too. However, you don’t have to only do 1-pot meals, you can easily bake up various meats in the oven and have simple side dishes. Pick a protein, a Veggie, and a grain/starch. Add the meals to the days of the week where you believe you will have more time to cook and the family can be together to enjoy. The other nights can be leftover or mix-and-match prepped dinners. Mix-and-Match Prepped Dinners – these are dinner components that you have at the ready. For example, make rice ahead and keep in fridge – or even freeze portioned out. Pasta can be made ahead, but doesn’t do as well after freezing. Grill some chicken or sausage or ground meat with mexican seasonings. and have ready to reheat and top with a fresh tomato or mango salsa or tomato sauce. Bowls! Have pre-prepped ingredients ready for Rice or noodle bowls Click here for more on Bowls. For lunches, plan out WHO needs lunch prepared at home and WHAT the menu will be. For Kids lunches – and mine too, as I ALWAYS bring my own lunch to work so I can ensure it is healthful and I save money for something fun for me later, like new shoes or a pedicure 🙂 – I prepare ideas for the week on Sunday’s with the girls, so that we are not having frustrating mornings where they cannot decide what they want. 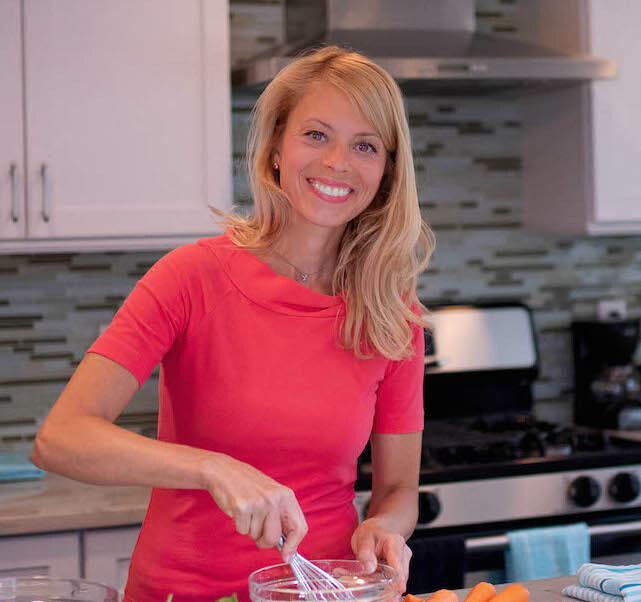 Then, list the lunches out for each day, whether it is making sandwiches the night before, having leftovers from dinner, or prepping salads for a couple days. 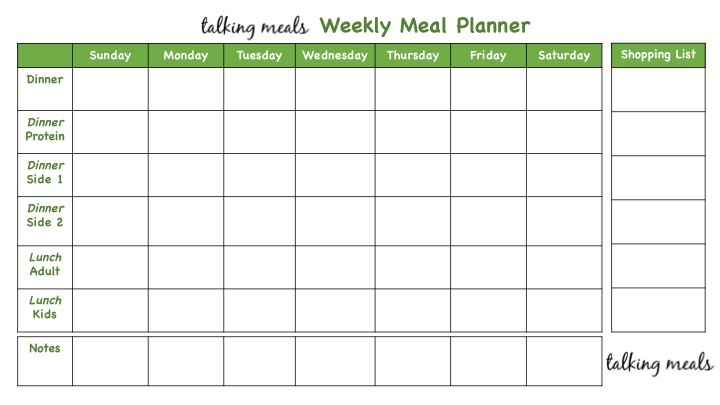 Here is an example of what your completed Meal Planner might look like. If this looks overwhelming, start with ONLY 3 dinners and for the other nights, continue to improvise based on what you have in the house. Eventually, you will work your way up to filling out the sheet completely! List out the Dinner components, including protein, vegetable, and starch. Then, for each meal, list out the ingredients that you need to purchase in a shopping list. My Weekly Meal Plans make this incredibly easy because it is already done for you! For Lunches, do the same. For any recipes that you find on your own, download my Weekly Meal Planner above for a simple template! Last, list out any preparation tasks that can be done in advance. This usually includes peeling/chopping veggies, marinating meats, making rice, or making meatballs or other components that can be frozen and then put directly into the oven when ready to cook. You can even cook some casseroles on Sunday and then heat them up on the night you want to eat them. 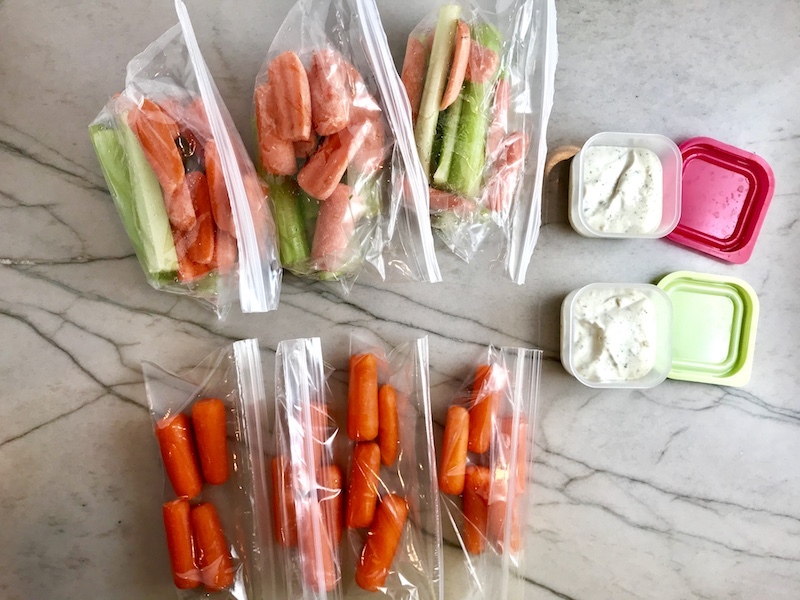 For Kids lunches, we prep-ahead lunch components – cut up carrots, make snack bags of crackers or grapes, cut up cheese and turkey for DIY cracker sandwiches. These are just some examples. For my lunches, I have lots of salad components ready or simply bring leftovers from the night before. Now that you have your list of prep-ahead tasks, start prepping! 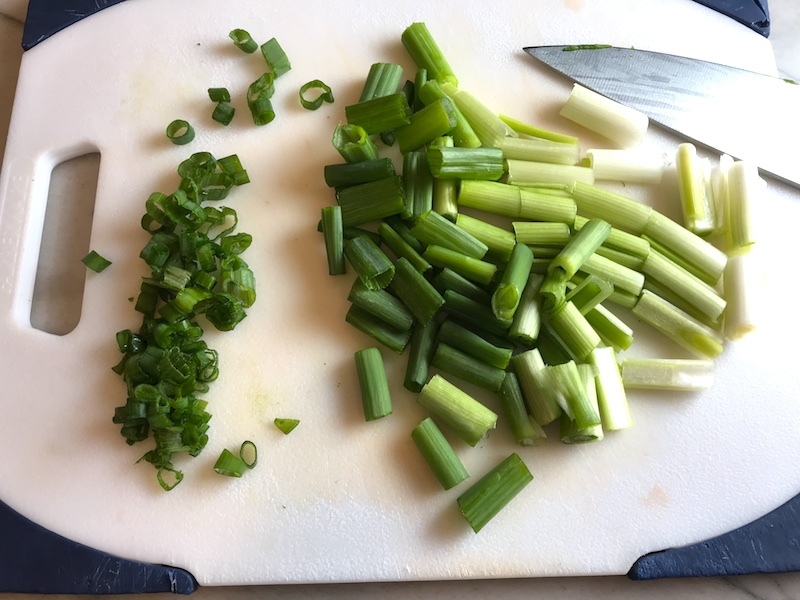 I place the ingredients in baggies/storage containers and then in a bowl or on a pan that will be specific to that particular recipe along with any other ingredients (example, soy sauce or cumin), so when I’m ready to cook, I simply pull out the bowl/pan with the ingredients and I can get cooking! This is also the time to prepare other items to have on hand for the nights you have NOT prepared new recipe/meals, the mix-and-match meals. 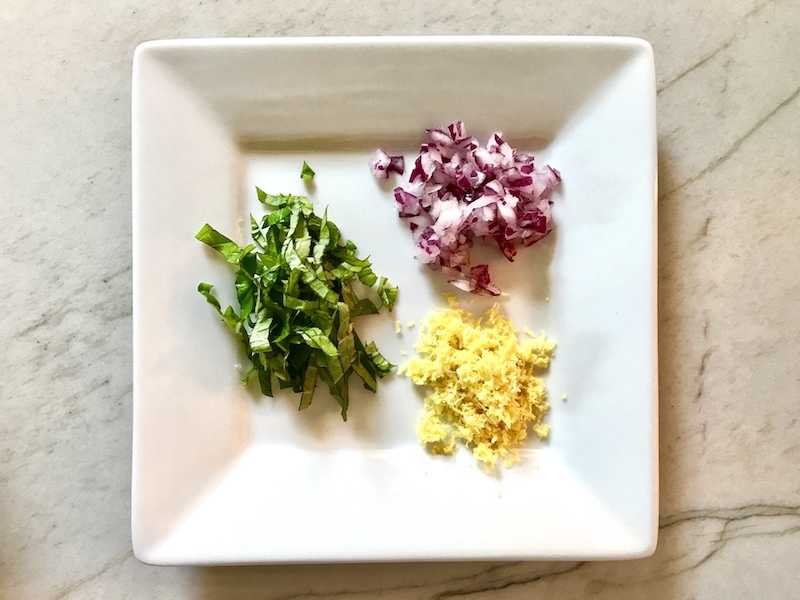 For the mix-and-match meals, I make rice and pasta ahead of time on Sunday and then again mid-week as needed to make sure there is always an easy side dish or base of a 1-pot/pan meal that can be whipped up. 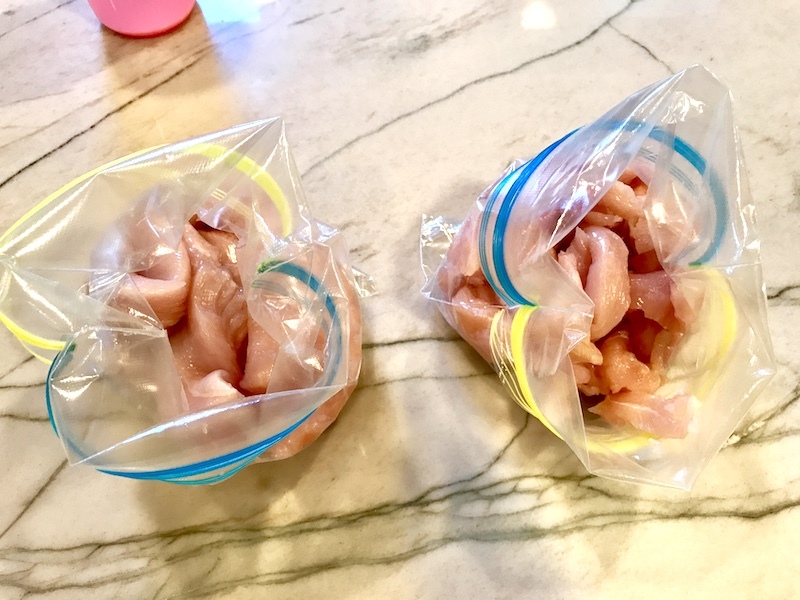 I also cook a few chicken breasts or a pork tenderloin or ground meat, or other simple protein so that it can be used in a variety of ways. I also keep lentils and lots of fresh veggies on hand. An example of a whipped up mix-and-match dinner is cutting up some cooked chicken breast and adding it to pasta with some cut up fresh tomato, basil, and parmesan cheese. Super Simple! Or tossing some cut veggies in a skillet with soy sauce and sesame oil and having a quick Stir Fry over Rice. If YOU have any tips that you can share, PLEASE send them my way and I will be sure to give credit in my next post!